Running in to deliver the penultimate delivery of his final over, Ashwin stopped after entering his delivery stride. Buttler didn't have his eye on the bowler and slipped out of the crease. As soon as he saw that, Ashwin simply turned around and broke the stumps at the non-strikers' end with the batsman out of his crease. The decision was sent up to the third umpire, who didn't need much time to send Buttler on his way. Speaking at the post-match press conference, Ashwin said of the incident: "Look, it was very instinctive. On my part, it was very instinctive. It was not planned or anything like that. It's there within the rules of the game. I don't understand where the spirit of the game comes, naturally if it's there in the rules it's there." Responding to a comparison drawn between this incident and the 1987 World Cup match between West Indies and Pakistan - where Courtney Walsh did not run non-striker Saleem Jaffar out in the last over of the match, despite the latter being well out of his crease - Ashwin said the question of 'sporting' didn't arise when it came to rules. "I don't understand the point of sporting or sportive in that point because it's rules. What applies for one man does not apply for everyone else. Neither was Jos Buttler playing there nor was I played so it's very pertinent to just not compare two people..."
This was not the first time Buttler had been run out backing up too far. On air in host broadcaster Star Sports' "Dugout", Kumar Sangakkara pointed out how, in a game against Sri Lanka in 2014, Buttler was run out in a similar fashion after two warnings by Sachithra Senanayake. Ashwin, too, had attempted dismissing a batsman in similar fashion a few years ago. During an ODI against Sri Lanka in 2012, Ashwin had run out Lahiru Thirimanne for backing up too much. The appeal was withdrawn by then India captain Virender Sehwag, who stated that Ashwin had warned Thirimanne before attempting the dismissal. Royals' coach Paddy Upton, though, didn't bother about the technicalities. He was miffed, and it showed in the press conference. 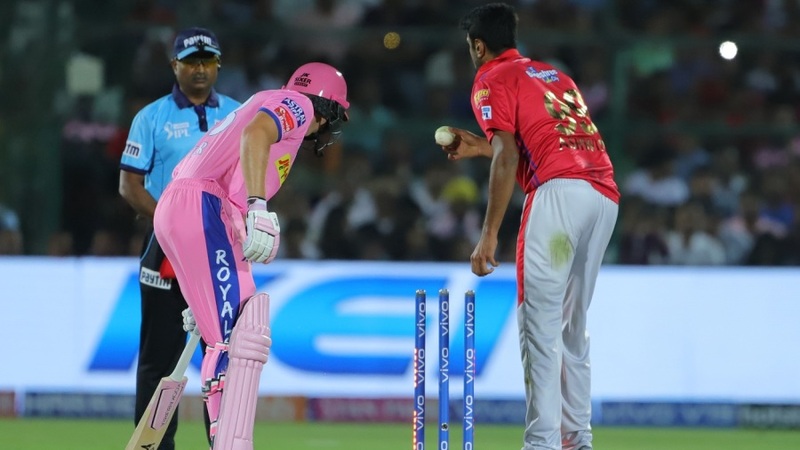 "I think R Ashwin's actions tonight speak for him and represent him, when I looked at his team-mates," Upton said, "and I'm not sure it represented his team-mates. I think we'll leave it up to the IPL fans to decide if that's the kind of things they want to see, and we'll leave it up to the cricket world to judge R Ashwin's actions tonight. But for us, we're certainly here to play cricket and entertain the fans and be good role models for people who love the game." At the end of the match, Buttler shook Ashwin's hand, but refused to look his way. Just behind Buttler, Upton seemed to have said something to Ashwin while shaking his hand, which made Ashwin stop in his tracks and give them a bemused look. Ian Chappell Why all the furore over the Ashwin-Buttler dismissal?